1. The FY03-05 CAS and the FY06-07 ISN were aligned around Nicaragua’s first Poverty Reduction Strategy Paper (PRSP) which was later revised and renamed the National Development Plan in 2005. 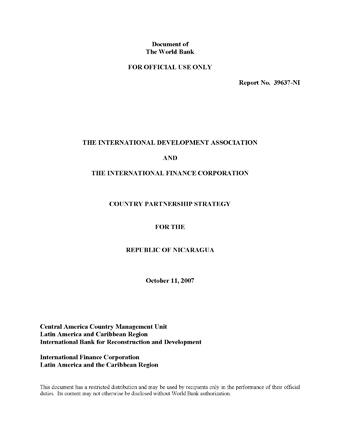 Although Nicaragua’s core objective to reduce extreme poverty was not achieved to the extent desirable, achievements were made across the program with considerable progress in promoting a stable macroeconomic environment, reducing the fiscal deficit significantly, and lowering external debt to sustainable levels by achieving the HIPC Completion Point and obtaining further debt reduction through the Multilateral Debt Relief Initiative (MDRI). Growth has been modest averaging around 3.2 percent per year since 2002, and exports have doubled. Though the Bank was instrumental in the increase of poverty spending from 9.6 percent of GDP in 2002 to 13.6 percent in 2006, greater expenditure has yet to translate into significant gains in poverty reduction. 2. Nicaragua remains the second poorest country in Latin America after Haiti. Although economic gains have reduced the scale and severity of poverty in Nicaragua, it is still unacceptably high with 46 percent of the population living below the poverty line. To achieve the Millennium Development Goals (MDGs), the rate of progress will have to be stepped up. The key development challenges are to accelerate growth over a sustained period and ensure that its benefits are broadly shared. To achieve these objectives, Nicaragua will need to maintain a sound macroeconomic and fiscal policy, improve poverty targeting and efficiency of public expenditures, dramatically improve human capital formation, and expand economic opportunities for the poor by creating an enabling environment for investments and job creation. 4. Indicative International Development Association (IDA) allocations for the five year period FY08-12 could amount to around US$ 240 million. In the proposed CPS, the Bank Group has selectively chosen focal areas for engagement. The annual series of budgetary support operations, the Poverty Reduction and Support Credits (PRSCs), together with an associated technical assistance credit would allow the Bank to engage in the reform program of the Government focused on governance and public sector modernization, the investment climate (property rights and regulatory institutions), and improvements in social service provision. New investment operations would be limited to urban and rural water and sanitation, public sector management, land administration, and rural roads. 5. The Bank’s ongoing portfolio of eleven operations, many of them relatively new, and recent analytic work provide ample opportunities to stay engaged on key policy issues. In energy, the Bank will work closely with the lead donor, the Inter-American Development Bank (IADB), to ensure that our programmed Analytical and Advisory Activities (AAA) contribute to improved sector performance. We will also continue to support the education sector through the Education for All Fast Track Initiative’s (EFA-FTI) Expanded Catalytic Facility, and help the Government develop a national strategy to combat chronic malnutrition through appropriate advisory services. 6. Complementing the Bank, the International Finance Corporation (IFC) aims to help accelerate private sector development supporting projects both at the regional and country levels. In Central America, IFC has been focusing on deepening regional integration, with priorities including: i) strengthening and broadening the financial sector, including access to term financing by micro, small, and medium size enterprises (MSMEs); ii) helping improve physical infrastructure; iii) supporting competitive firms in agriculture, industry and services; and iv) promoting south-south investments and helping local companies become regional and global players. These priorities are reflected in IFC’s operations in Nicaragua with a focus on: a) improving the investment climate by simplifying business regulations at the municipal level; b) strengthening MSMEs’ competitiveness and improving their access to finance; c) assisting exporters and hard currency earners, such as in agribusiness and tourism; and d) addressing critical infrastructure needs such as transport and energy (including renewable energy). 8. The main risks to the Bank Group’s FY08-12 Country Partnership Strategy arise from the possibility that the new administration may be unable to generate broad consensus on the politically challenging reform agenda or to resist measures that could threaten macro stability, undermine investor confidence and jeopardize growth prospects. These challenges will beaddressed by maintaining a continuous and close dialogue with the authorities and coordinating with key stakeholders, including the International Monetary Fund (IMF) and the Budge Support Group (BSG), a roundtable of key donors. Weak institutional capacity could hinder reform and program implementation. This will be partially mitigated and supported by capacity building and strengthening fiduciary and sectoral oversight at the Country Office. Natural disasters pose a significant risk during the CPS period, which will be partially mitigated by AAA to better identify risk and its impacts (i.e., theFY08 Central American Probabilistic Risk Assessment) and help with the design of a regional risk insurance mechanism. A final key risk stems from the challenges of effective donor harmonization and alignment. The Bank will strengthen its strategic role in enhancing the Government’s capacity to lead these processes and work closely with our donor partners to follow up on the implementation of the national harmonization and alignment plan. A mid-term CPS Progress Report is scheduled for early 2010, which will allow the Bank to review and discuss necessary adjustments.